After exploring most of Brussels throughout the afternoon, we finally returned to our hotel room just in time to miss the rain storm that passed over us. Good timing on our part. As we had only planned to explore Brussels on this particular day, we got in everything we had wanted to see, including the Grand Place and the Manneken Pis. But as day turned into night, it became clear that we were going to have to find a place to have dinner. Our waffle wasn’t enough to tide us over for the day. Next door to our hotel was a lively restaurant that looked like it would do the trick, so we decided to wander over and see what we could find. Turns out that the place was good enough that we actually came back here again for dinner on the last night of our vacation. 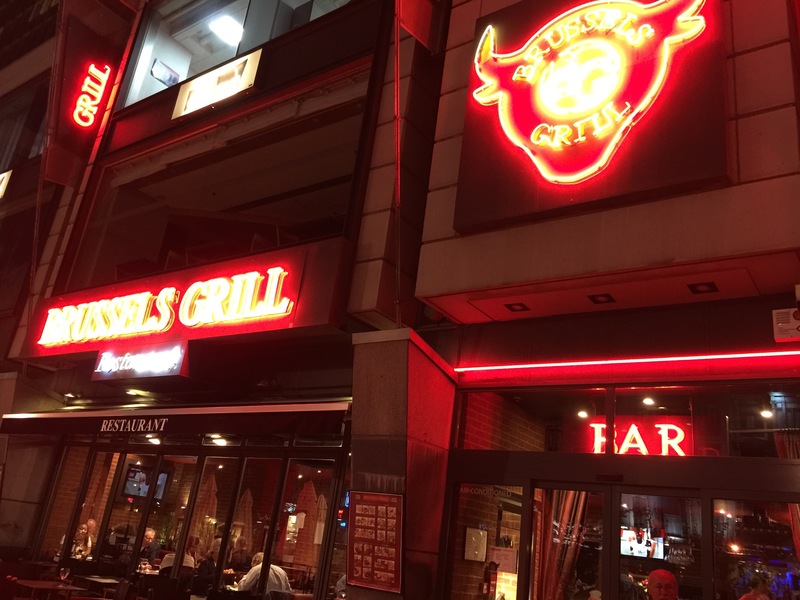 Brussels Grill Restaurant Steakhouse is part of a chain of restaurants started in 2003 and today includes 5 different locations. The restaurant specializes in grilled meats where everything is presented simply to make the experience as friendly for guests as possible. The location we dined was part of Place Rogier in the Manhattan Center and was a large restaurant featuring a full bar with indoor and outdoor seating. As it was cold and rainy outside, the outdoor seating wasn’t really going to work, but the inside was large and comfortable enough. When in Belgium, drink Belgian beer, right? That was my husband’s philosophy. Good thing he’s a huge fan of Belgian beer to begin with. 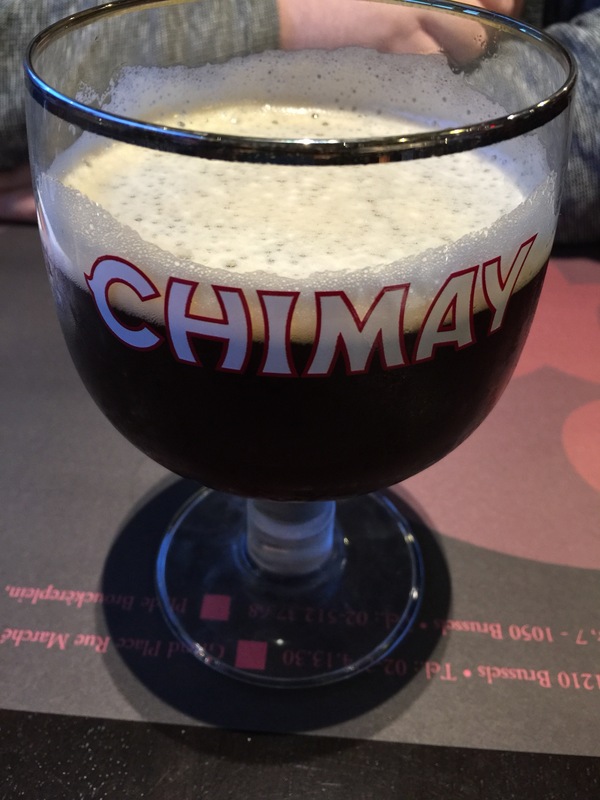 The first night we dined at Brussels Grill, he ordered his favorite Chimay. My husband likes all of the different varieties of Chimay, so there was no need for me to ask him if he liked it. 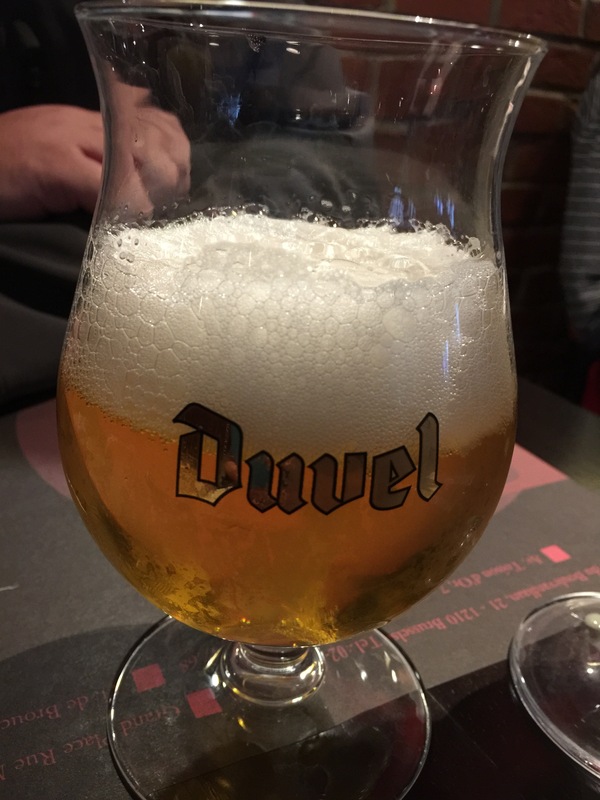 The second night we went to Brussels Grill, my husband decided to shake things up a little and order the Duvel instead of the Chimay. This was a little surprising as this is a light beer and my husband tends to prefer dark beers. However, he figured that he might as well try something new and to his surprise he actually enjoyed the Duvel. He didn’t like the Duvel as much as the Chimay, but it must have made enough of an impression on him because since we’ve been back home, he’s purchased both Chimay and Duvel to have at home. I just love that every time you order beer in Belgium each beer comes in its own particular glass. I had to bring a Chimay glass home with me, luckily it survived the flight home unscathed. 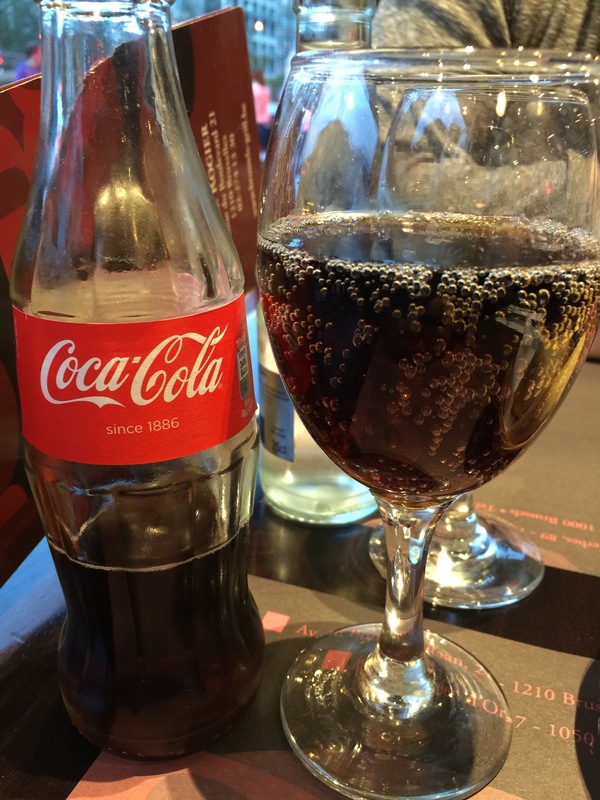 I started off order a Coke, boring, I know, but I love how in Europe Coke’s aren’t just served out of a fountain machine, you get the whole can or the bottle, in this case, a glass bottle. Like any other place you find soda served in Europe, the can/bottle come cold out of the refrigerator and is served to you with a glass from which to drink out of. No ice, unless you request it, and even then they might not have it, as ice is hard to come by in Europe. No matter, the drink was cold enough, and besides it was quite cold outside. However, it wasn’t until after I ordered my soda that I realized that the bar had a whole line of non-alcoholic drinks that they made, so I couldn’t go without trying a couple. 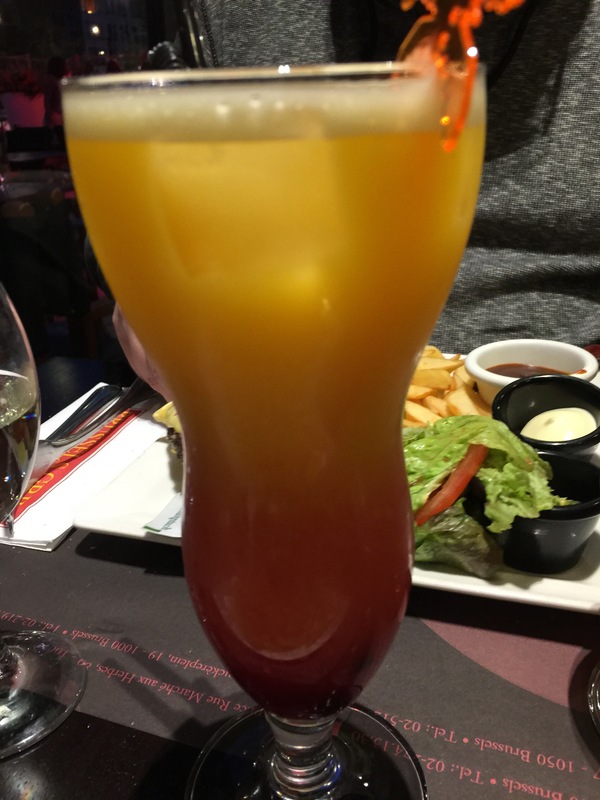 My first drink was a Bikini, made with orange juice, exotic nectar and grenadine. I’m a huge fan of grenadine, I know it’s sickeningly sweet, but it’s so good in drinks. So, a drink with grenadine in it had to be good. Orange juice, grenadine and fruit nectar, there couldn’t be anything bad about it, and there wasn’t. It was a sweet drink, but refreshing and cool and tasty. 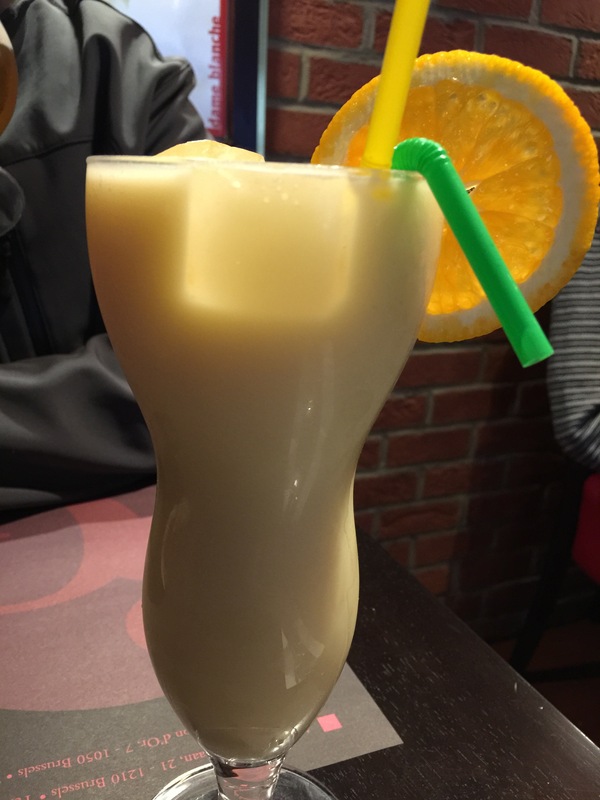 The second night we dined at Brussels Grill I decided to try out the Monoi which is made with orange juice, banana nectar, pineapple juice and coconut milk. Any drink made with bananas couldn’t be bad, could it? And it was delicious. The coconut milk was the one ingredient in the drink that brought it all together. The Monoi was mixture between tasting like a pina colada and some sort of tropical exotic fruit drink. The coconut milk added creaminess to the drink and helped to keep the drink from being cloyingly sweet. I had to resist ordering a second Monoi. What makes dining at Brussels Grill so easy is that everything on their menu is accompanied by a picture. Therefore, regardless of what language you spoke, it was easy to order what you wanted without guessing at what the menu said. Luckily though, pretty much everyone in Belgium speaks excellent English. The first night we dined here we decided to start with the cheese croquettes as a starter. 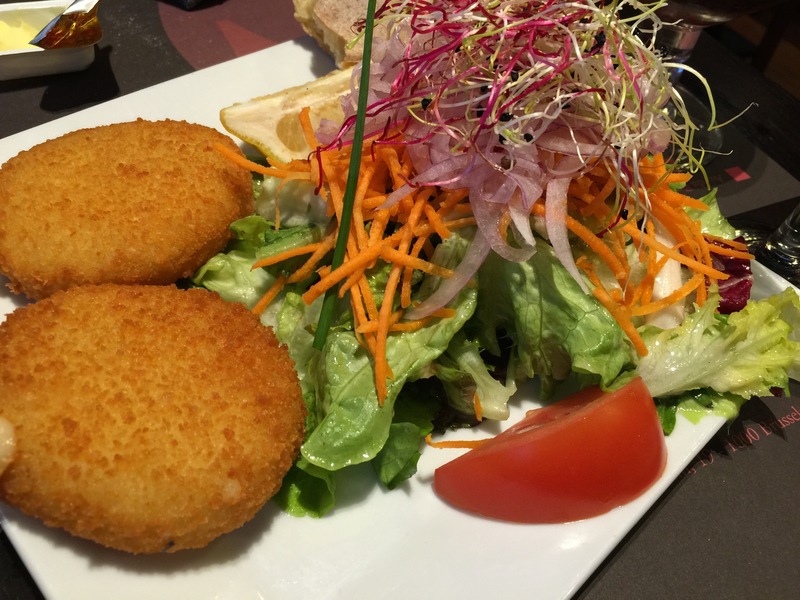 Two huge croquettes filled with melting cheese are served alongside a hefty salad. The cheese in the croquettes wasn’t my favorite as it was so mild in flavor. However, my husband really enjoyed it, so I gave him my share. The croquettes were perfectly cooked and incredibly crunchy and golden brown on the outside and the melted cheese was just oozing out of the croquette on the inside when you cut into it. The side salad that came with the appetizer really was quite tasty and fresh and even though I didn’t expect it, I really enjoyed it and ended up devouring it. Oops. On the second night, we went in a different direction and I decided to order the garlic scampi as an appetizer. 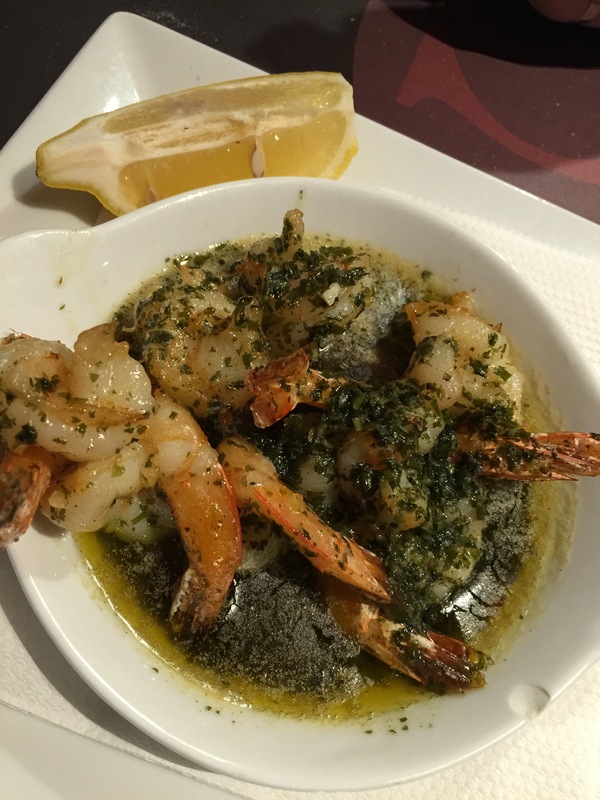 Served sizzling to the table, the shrimp are peeled and butterflied before being baked in a delicious sauce of butter, oil, garlic and herbs. A little wedge of lemon to serve on the side and you had a very tasty shrimp dish. The flavor of the garlic and butter shine through and completely coat the shrimp and with that touch of lemon tang from the lemon wedge we squeezed over the shrimp, it was perfection. It was mouth-watering and I couldn’t stop eating. The only disappointment I had was that there wasn’t grilled bread served on the side so that I could continue to sop up the wonderful garlic butter sauce. It turned out that both times that my husband and I dined at Brussels Grill, we both ordered the same entree for both meals. I guess we both liked what we ordered enough that we wanted to get it again. My husband got the XXL hamburger with cheese and bacon. Served with all the fixings, including fries, my husband was a happy man. 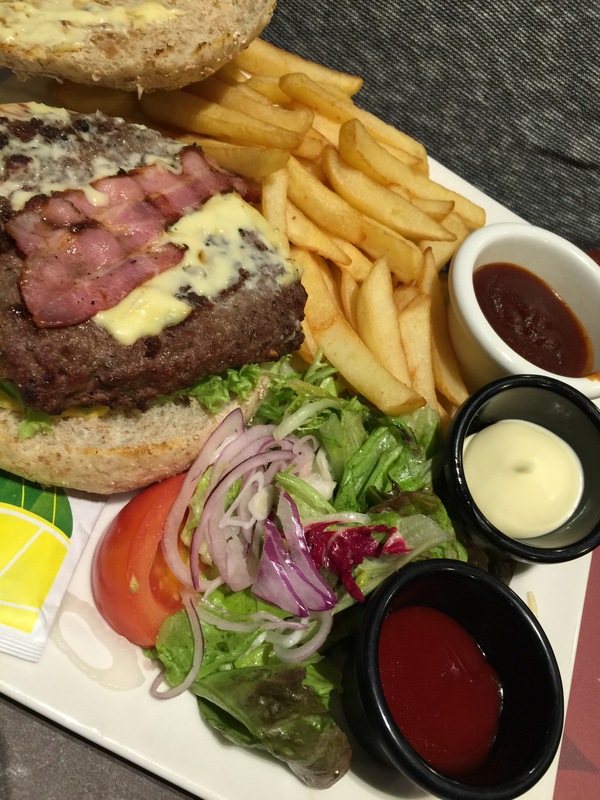 He thought that the burger was really taste with the cheese and the bacon and it was perfectly cooked and juicy. The burger was also just the right size for him with the fries to fill him up. By now, since we were at the end of the trip, we really were just looking for simple comfort food and this hit the spot. For my meal, I ordered the roasted salmon. Also served with fries and a side salad, I was really expecting that much from the salmon, but after one taste, I realized how wrong I was. The salmon was perfect cooked and moist and flavorful. It was nice and crispy on the outside and tender and flaky on the inside. 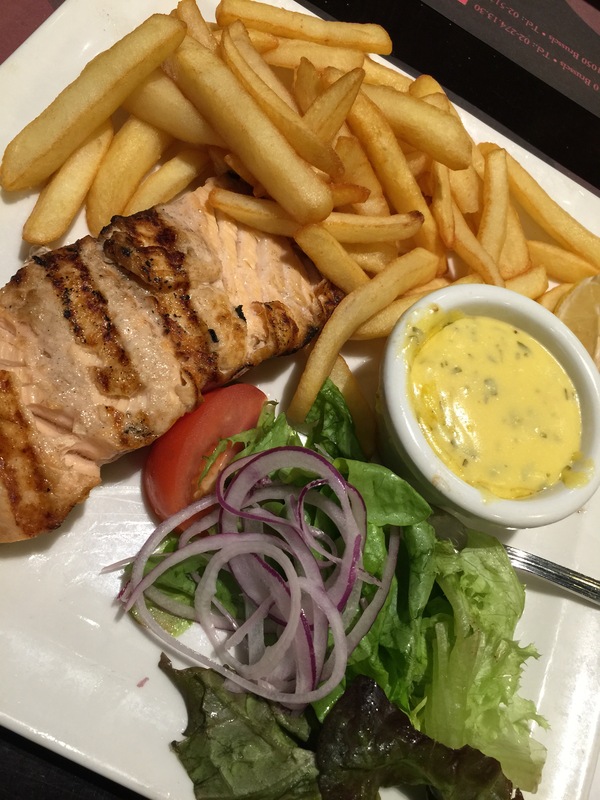 Again, like my husband, I thought this was the perfect sized meal for me and it really hit the spot since the salmon was so flavorful and the fries were so delicious. After our first meal at Brussels Grill, we were so full that we didn’t bother with dessert. But on the last night of our European trip, we decided to splurge a bit and decided to order a dessert to split. 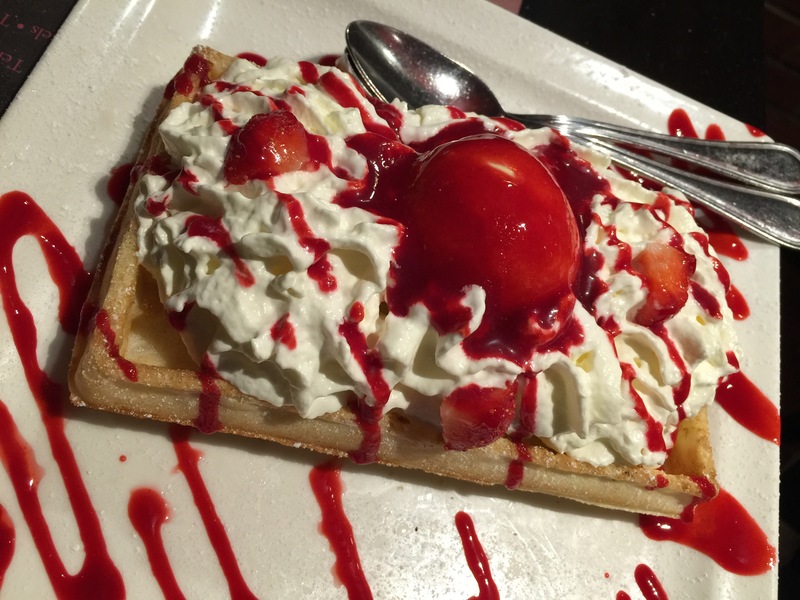 We ordered the Brussel’s waffle topped with whipped cream, a scoop of ice cream, some fresh sliced strawberries and some strawberry coulis. This dessert was delicious and decadent. And my husband and I loved every single bite of the Brussel’s Waffle. Unlike the waffle which we had at the The Waffle Factory, this truly was a Brussels waffle. It was light and airy and rectangular with deep pockets to hold all that whipped cream goodness. Since the waffle itself doesn’t have any added sweetness, the whipped cream and the ice cream were all the sweetness we needed. Add in the tanginess from the strawberry coulis and the dessert was just perfect. Sometimes, even though you’re traveling in a foreign country, all you want is something easy and delicious and hassle-free. What could be better for us than a restaurant right around the corner from our hotel that served delicious, hassle-free food hit the spot for these weary travelers. After spending our days sightseeing, not only around Brussels, but as was the case on our second trip to Brussels Grill where we had just returned from a long day trip out to Luxembourg, all we wanted was to grab a great bite to eat, and Brussels Grill delivered on exactly what we needed. It may not be the world’s most glamorous food, and it may not be the world’s tastiest food, but for us, at that moment, in that time, it was just what we needed, and we couldn’t have asked for anything better.